I love love love the colour but it's just so hard to work with.. So streaky and patchy after 2 coats =( The Seche Vite top coat helped a little but I'm still not happy with it. 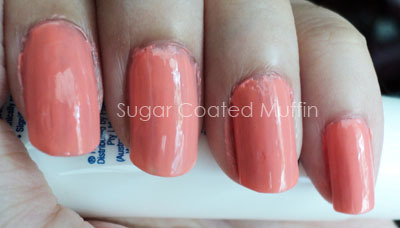 I'm beginning to give up on Essie.. =/ Even the earlier one I tried out wasn't that good. I know I've been lagging behind on posts. Been occupied with work, fell sick, worked some more and fell sick AGAIN. Pfft.. I was at the Maybank Treats Fair and there were a couple of shots of me so I can show you my OOTD during work xP Yes.. Pathetic content for a blog post, I know.. Haha.. This is the dark blue peplum dress I bought from Sungei Wang for RM25. White laced-back cardi RM 25 & black shorts RM 40++?? Both from SW too. The uber cute pillows from our 'neighbour', Henry's Cats & Friends. If you're wondering, I was working for Sustainability ESG 2020. ESG stands for Environment, Social & Governance. This non profit organization aims to improve our country to bring up our world ranking so we can get more foreign investments. Do check out their page for more info and win a handbag, sunglasses or even a trip to Langkawi while you're at it! Totally unrelated but thought I'll inform you that there's this awesome deal for MagicColour lenses at Everyday. RM 20 only for a pair of their comfy 16mm lenses! This deal applies for Dazzle, Snow & Sparkling series only though. You can read my review on the Dazzle Gray lenses HERE. Not included in this deal but my review on Blushy Green can be found HERE. Hurry up cos the deal ends in a few days! P.S. I was gonna post pics of food then recalled that it's puasa now.. Not good to tempt ya..?